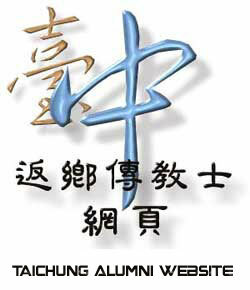 Welcome to the Taiwan Taichung Alumni Mission Website. This site is designed to be a resource to those who have served and will serve in the Taiwan Taichung Mission. Please feel free to browse, update, or add your profile to the Alumni Database, also check out the Recent News as well as post your own! We have a Current Missionaries section of the web site for all of the missionaries currently serving in Taiwan Taichung. If you will be leaving soon, or if you are a parent who would like to post your missionary's information, feel free to do so. This way, parents can email each other and learn about their missionary's experiences and/or companions together. If you forget your login information: Go to your alumni profile page, click on "Edit Profile", then when the next page pops up asking you for your information, just click on the "Request Password" link. A confirmation box will pop up asking you if you're sure, just click "Yes" and the system will generate an email to the address in your profile with the information within a few minutes. If the email address in your profile is no longer correct, email me and I will send you the information. Copyright © 2002-2006 LDS Mission Networksm · mission.net / ldsmissions.net · All rights reserved.